STEVE HACKETT is renowned as an immensely talented and innovated rock musician. He was lead guitarist with GENESIS as part of their classic line up. With his extraordinary versatility in both electric guitar and his composing, he involves influences from many genres, including Jazz, World Music, and Blues. He is equally adept in his classical albums to his own acoustic guitar compositions that have gained the admiration of many, and ambitious guitar/orchestral albums as well. 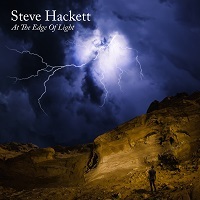 On January 25th, he presents his newest solo album, titled “At the Edge of Light,” which contains ten new tracks. “Fallen Walls and I” is a short instrumental opener, with a grand guitar solo in a Classical style, as well as some heavy and dark undertones, segueing into “Beast in our Time.” Soft vocals and orchestral instrumentation litter the landscape, complete with tender saxophone notes. A guitar solo breaks among the grey clouds, partially opening them for just a spell, forming back into a darkness that stays throughout. “Under the Eyes of the Sun” opens with a jovial sound, complete with bass guitar working the underbelly of the song. Harmonic vocals sprig up and color the landscape with fervor and confidence, while Steve lays down the lead breaks. “Underground Railroad” opens with a soulful presence in the vocals, without instrumentation. From there the clouds darken a bit, until the guitars break out. From there it branches in several different directions but keeps positivity at the center of its core. “Those Golden Wings” is an eleven-minute beast, opening with soft acoustical guitars and what sounds like a harp, leading to a solitary clean guitar riff and pensive vocals. It has a more straightforward sound, yet the vocals don’t venture too far. The main melody line is very alluring, yet that darkness remains throughout. His sense of the orchestral is grandiose. The song takes a lot of turns but that core vision remains. “Shadow and Flames” is exactly that…a tense track with subdued tones and the sense of something large to come. It has a middle eastern tone from what sounds like a sitar, while the drums keep a heavy and steady beat. “Hungry Years” sounds like a throwback to soft 1970’s Prog, with heavy vocal presence and a positive tone. It could easily be a single on the album, with its playful guitar notes and shining vocal harmonies. “Descent” opens with ominous guitar notes and drums, reminiscent of “Jacob’s Ladder” from RUSH. The dark march continues throughout the song, like a prequel to war, segueing into the short but aptly titled “Conflict.” The two songs as a duo remain very well paired together, forming the darker side of the album with resolve. “Peace” closes the album, with tender piano notes and vocals, a juxtaposition from the earlier two tracks. It’s a good album closer, ending things on a positive note. Overall, this album was all over the place. Each track had its own unique style and set of sounds. Sometimes harsh and ominous, while other times very tranquil, always melodic at its core. You can tell Steve’s been at it for a while in the business, because he has a seemingly endless well of creativity to draw from. Bravo!